How is Toby Eagle jewellery made? The world has become increasingly conscious about how our clothes are made and the impact they have on the environment. Jewellery is no different, with civil wars, labour abuses, and environmental devastation it is just as important to make sure you know where your jewellery is coming from. All Toby Eagle Jewellery is created with a focus on re-use and responsible production. Our objective is to diminish the negative impacts of dirty silver and Gold by reducing the demand for newly mined metals. We primarily use recycled/reclaimed sterling silver and gold in our pieces, all offcuts left over from creating our jewellery are refined and reused again. 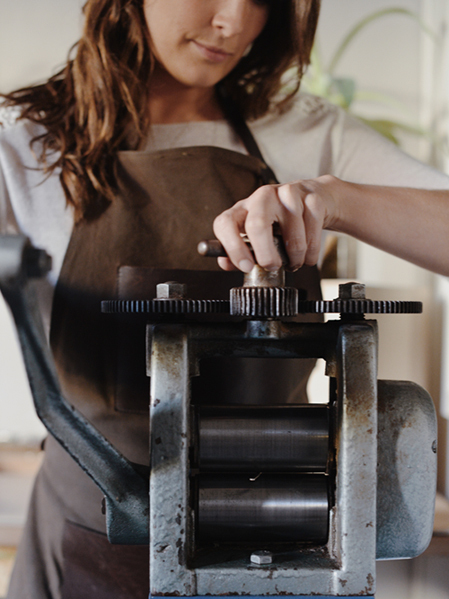 You can also be assured of responsible labour practices as all Toby Eagle jewellery is designed and handcrafted by metal smith Toby Eagle in her studio, on Sydney’s northern beaches. She uses traditional gold and silver smithing techniques, primarily using hand tools which means a low carbon footprint. We believe you really can make a difference when buying from independent designers and small, local businesses. So where possible we source materials from local Australian business. This means that the metal is not newly sourced directly from a mine, instead the silver, copper and gold comes from existing sources such as, old jewellery, off cuts from other jewellers, stripped copper wire etc. It is then refined back into high quality gold or sterling silver.